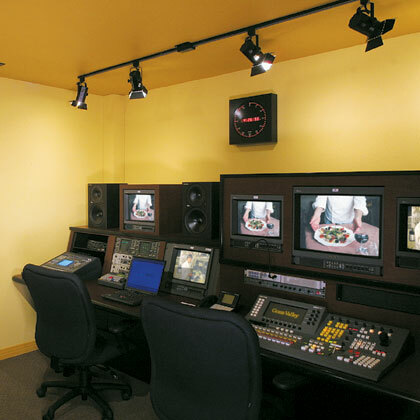 Directing your studio productions is easy from the comfort and efficiency of the Full Moon and High Tide Control Room. The centerpiece is a Grass Valley component digital (SDI) switcher model 1200 with chroma key. Audio is controlled by a Yamaha 03D digital audio board with on-board effects and moving fader automation. Wireless mics and hard wired mics are available for use. A DNF ST300 machine controller lets you control four video recorders remotely at a time. The video tape recorders are in the machine room while the controller stays in the control room. Full machine control at your fingertips. Graphics are supplied by the Chyron Maxine, a digital character generator. Fonts of any size or color can be created and full screen photos or graphics can be reproduced. A studio PA mic broadcasts your voice to the stage with RTS PL and IFB systems available. A complete Telos Model 1X6 phone talk show system is installed with four phone lines. A producer/screener station is set-up with a control panel that assigns which line is on-the-air. The internal digital hybrid outputs excellent quality from the phone line. The control room is easy to use and flexible. Perfect for Infomercials, interviews and telephone call-in shows.